This special program offers the opportunity to explore nature or new communities, discover history, or find a park. It could be an educational opportunity enjoyed by all ages. Open the Starting Point to any state and you will find a qualifying event. Never been to the White House (aka President’s Park)? Plan that trip now, visit during the three years of the special program, and get a stamp in your book. The EMERALD CITY WANDERERS club is sponsoring this national special program celebrating the 100th anniversary of the National Park Service (or NPS). We begin this special program January 1, 2016, the 100th year of the NPS, and end December 31, 2018, with an extra one year to finish and submit completed books. The following websites will assist in locating an NPS unit for this challenge. Booklet: $10. 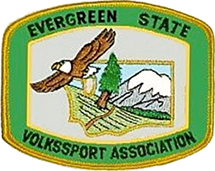 Patch:3”x4” mailed to participant at completion of challenge. Checks mailed to POC, payable to Emerald City Wanderers.